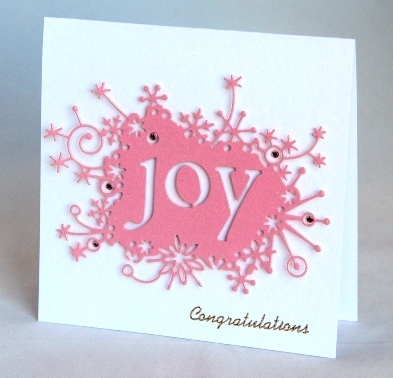 I have die cut the word joy and its frame of fireworks from pink pearlised card. It is embellished with small pink acrylic gemstones. The word congratulations is written in gold at the foot of this top fold card. The card is blank inside for your own message of congratulations and pleasure. The card is also available in blue so let me know which colour you would like at the checkout. If ordering by phone, please reference card #154.